Join Hansel and Gretel on their ominous journey into the depths of the haunted forest but be sure to leave a trail of breadcrumbs so you don’t meet the same fate as the traditional storyline goes. Spin the reel on this enchanting and spooky 5 reel slots online that throws up random bonus side reel games, free spins and tempting cash rewards. Learn how to play online slots now! 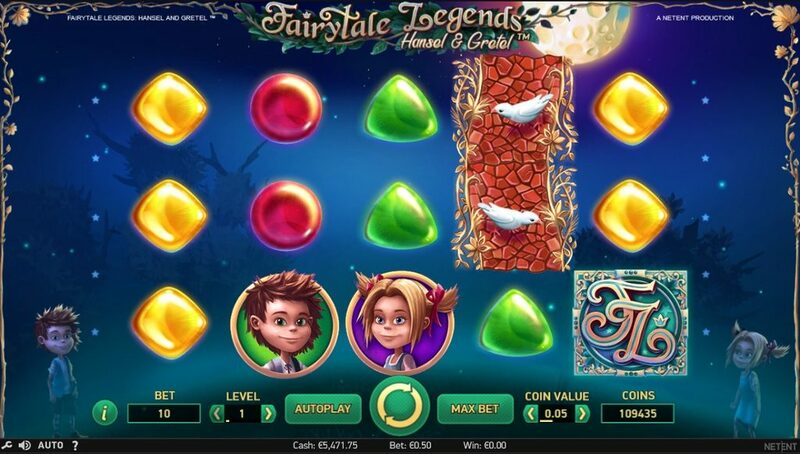 NetEnt really never disappoints when it comes to beautifully designed and creative slot experiences that attract more and more players to their online portfolio. They’re committed to securing their place in the lead of the online casino industry by coming up with more innovative games to satisfy players’ needs. Fairytale Legends:Hansel and Gretel tells the story of the two children who got lost in a forest and came upon the candy house of an evil witch. Will they come out alive? It’s up to you to follow the breadcrumb trail and collect prizes while finding out! If you're interested in slots promotions then play here here. Fairytales have always been a source of fascination for us, especially during our childhoods, where everything seems magical and exciting. It doesn’t have to stop there, though. Through this slot experience you can return to that excitement, along with Hansel and Gretel. Explore the mysterious forest in which you end up and beware of temptations such as the candy house we all know to be a trap. Through being careful and following the breadcrumb trail home, you might just avoid the evil witch and collect all the treasures this game has to offer. 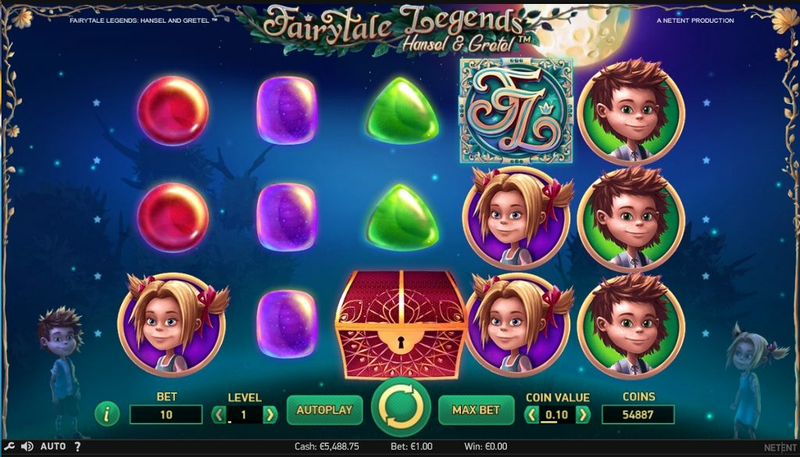 Fairytale Legends: Hansel and Gretel has 5 reels, 10 paylines and beautiful enchanting music that will make you feel like anything is possible on this adventure. The starry background might steal you away, but don’t worry, Hansel and Gretel are by your side. You only have to press the spin button and they will start walking along with you. You can place your bet starting from an 0.01 coin value and going up to 2.00. Then, adjust the bet level between 1 and 10 and create the bet that is right for your needs. The symbols in this online slot games are mostly colourful and tempting candy that will reward you will lots of coins and this time, without a witchy trap. Also watch out for the adorable children, who are just as generous with those who help them. There is a staked Wild symbol represented by a beautiful and inviting path you should follow. Whenever this symbol appears and covers the entire wheel, it triggers a re-spin, and you get more chances of winning. The magical chest is a Bonus symbol and if you spin 3 or more of them, it rewards you with one of 3 Bonus features. Candy House Bonus is the first one, where you can pick 3 candies out of 15, for a chance to multiply your winnings. Then, you can either choose the average value of the 3 multipliers or only one of them. Either way, it must be profitable! The other 2 Bonuses are the Free Spin Bonus, rewarding you with 15 Free Spins and the Coin Win Bonus, which gives you the equivalent of your current bet multiplied by 15x. 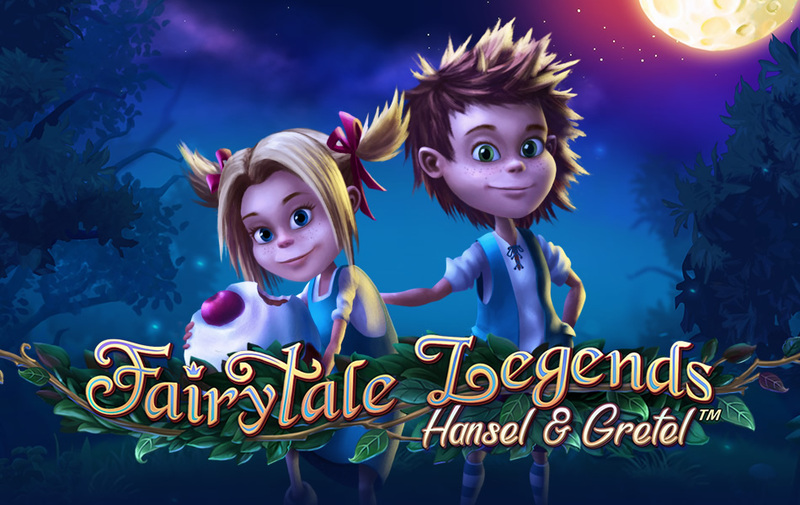 Fairytale Legends-Hansel and Gretel not only brings magic to your slot experience, but the multitude of features will make anyone want to play, even if they’ve long grown out of fairytales. Another equally lovable game is our Gold Rush.